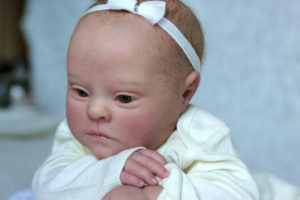 This beautiful Down Syndrome reborn baby is currently for sale on eBay. Time of Birth: 4:07 p.m.
Super pretty little Down Syndrome Realborn(R) Prototype # 2/4 by the amazing Bountiful Baby. Thank you, Jessica, & everyone at Bountiful Baby for this unique & wonderful opportunity to reborn the first ever 3D scanned Down Syndrome baby. “A Realborn® is a replica of the real baby. 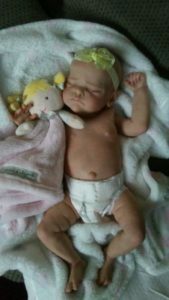 My name is Isabelle Ashing & I am the artist behind Babies Reborn by Isabelle 🙂 My goal when reborning is to produce the most beautiful, high quality & realistic dolls of which I’m capable. 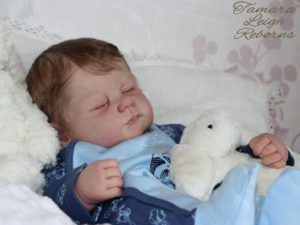 All of my fashion~celebrity repaints & reborn baby dolls have been sold & are in private collections worldwide. I’ve been in the doll industry for over 11 years as a doll artist. I’ve been a featured artist in Fashion Doll Quarterly (FDQ) magazine & both fashion~celebrity repaints & reborn dolls have been in group art exhibitions in Toronto. 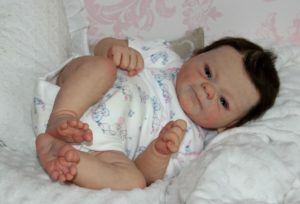 Baby Patience was reborn using Genesis heat set paints & sealers. Very thin layers were applied in order to create realistic and beautiful skin tones. Intricate veins, soft micro veining, subtle blushing & tonal variations were also added for detail. Baby brows were delicately painted with very thin strokes. Eyelashes were rooted to match her hair color. Baby’s hair was carefully hand painted over the course of several days and then sparsely rooted with high-quality silky Delta Dawn mohair in Light Baby Brown. All hair has been completely sealed. Great care should be taken with this very delicate mohair. Fingernails & toenails were realistically tipped. Gorgeous German blue/grey glass eyes from Bountiful Baby were used. Bountiful Baby front female tummy/chest plate fully painted is included. 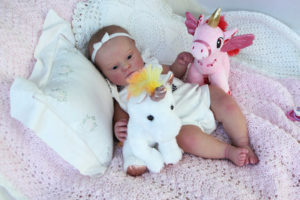 Baby has a cuddly doe suede body with the filling of only fine glass beads & high-quality Fiberfill ~ no sand ever used! Little Patience has full arms & full legs. All photographs were taken in natural daylight with professional lenses at various times of the day. Please note that each monitor will produce different color variances. Baby Patience is a one of a kind doll artwork painted for adult collectors & NOT recommended for children. She is fitted with a strong magnet to connect with her magnetic pacifier ~ not suitable around individuals with pacemakers. The doll is from a smoke & pet free environment. 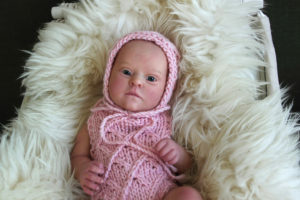 Baby will be very securely wrapped in a super soft baby blanket for her journey home to her new mom. All packaging materials are new & purchased exclusively for shipment of the dolls.